On my own for dinner tonight. Have to admit. I’m really jealous of J right now. She went to dinner with some co-workers at Rustica. I’ve been wanting to go there since it opened, but haven’t found the right special occasion. I guess J can scout it out and decide if she wants to go back or not. Before dinner, I had to make a grocery store run to pick up a few things. I was thinking about what I was going to do for dinner and I really didn’t want to cook. My first thought was pizza, but I didn’t really want to wait that long. My next thought was Subway. I was going to stop at the one inside Walmart, but I had too much stuff in my hands, so I figured I’d just hit the one on Stadium near 9th. On my way to that location, I had to pass a local sub shop right on the corner of 9th and Stadium. 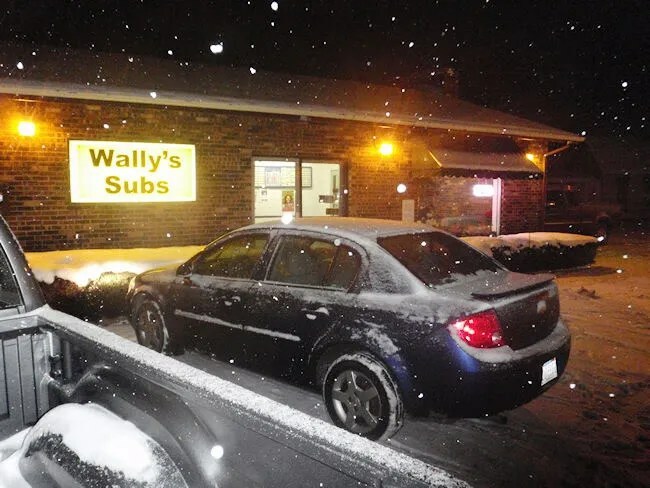 Until we moved to this part of town, I had never heard of Wally’s Subs. It’s a fairly inconspicuous building…well, other than the three large signs. The building is a small brick building with a parking lot just big enough for no more than a few cars. The building is divided into two areas. When you enter the front door, you come in to a little hallway between the two rooms. To the right is the order counter and a small seating area that even includes a vintage Ms. Pac-Man game. I was sooooo tempted. It’s not an old game in a new case. It’s the old game that you sit down and look down on the video screen. I was going to take a picture, but I got distracted with something else….sorry. To the left, is a much larger dining room with booths that look like they haven’t seen new leather covers since the 70’s. I headed up to the counter to find a menu. There are special boards all over the place, but there is no menu hanging anywhere. They have one taped to the counter and there a couple big, sit-down restaurant style menus sitting on the glass case that holds the desserts and bottled drinks. There was only one girl working behind the counter when I walked in and she was working on orders for a couple parties in front of me. She said it would be a few minutes which gave me a chance to look over the menu. The menu is simple and has it’s roots in the deli. There is a huge selection of single meat, two meat, or three meat subs that you can get in a 5-inch, 7-inch, or 9-inch sub. There are also a few unique creations, salads, and wraps. They have over 60 combination’s to choose from. I was starting to lean towards a pastrami and corned beef sub, but instead went for a warm French Dip. I was given the choice of bread…I chose wheat..and whether I wanted it toasted…I did. I chose the 9″ because I was pretty hungry, but on a normal day, I could have gotten by with the smaller one. The total was a little over seven bucks for just the sandwich. I took a seat and looked at the Ms. Pac-Man machine wondering if I had a quarter in my pocket. I got sidetracked by the free wi-fi though. It doesn’t matter if I need to check my e-mail or not, it’s almost a habit to connect to the wi-fi just to see if it actually works. A few minutes later, my sandwich was toasted, wrapped up in butcher paper and put into a white paper bag alongside a cup of Au Jus that was warmed up and wrapped tightly in aluminum foil. I got home just as J was leaving to head downtown. I unwrapped the Au Jus first and it smelled heavily of onions. This is pretty common with French Dip Au Jus and even being an onion loather, this doesn’t usually bother me because the onion flavor isn’t what really bothers me. It’s the combination of the flavor and the texture. Just one of those stupid things from my childhood. The French Dip is really just a few slices of deli sliced roast beef and Swiss cheese on a sub roll. 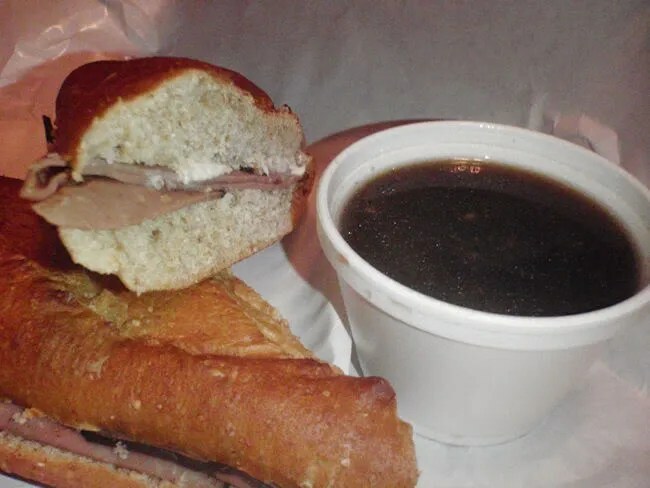 The only thing that made it different from any of the other sandwiches on the menu was the Au Jus for dipping. It was good, but not really what I think of when I think French Dip. What’s surprising to me is to see all of the reviews of Wally’s on sites like Google. Personally, I’d rather have the same amount of meat on two slices of bread as opposed to the sub, but that’s just me. I’m really interested in trying a few more of their combinations and see what kind of pastrami they have. Wally’s has managed to survive with a national competitor just down the road. It’s definitely a good option when you’re in the mood for a sandwich. ← Erbelli’s Gourmet Pizza, Italian Bistro & Pub – Oshtemo Twp.